Let your customers take home their unfinished wine bottles to guarantee happy returning guests that might freely order by the bottle instead of by the glass. These convenient and simple bags seal to adhere to many state laws that require such precautions for transportation (see below). The bags have a an easy handle for carrying and come in packs of 50. STATE TAKE HOME WINE LAWS AND REGULATIONS All states now allow you the pleasure of finishing your wine at home. Many require, and others recommend, that the bottles be taken from the restaurant in sealed and tamper-proof wine to go bags so as not to be in violation of open container laws. Please check and comply with your local laws and regulations regarding transportation of open containers in a vehicle. Let your customers take home their unfinished wine bottles to guarantee happy returning guests that might freely order by the bottle instead of by the glass. These convenient and simple bags seal to adhere to many state laws that require such precautions for transportation (see below). 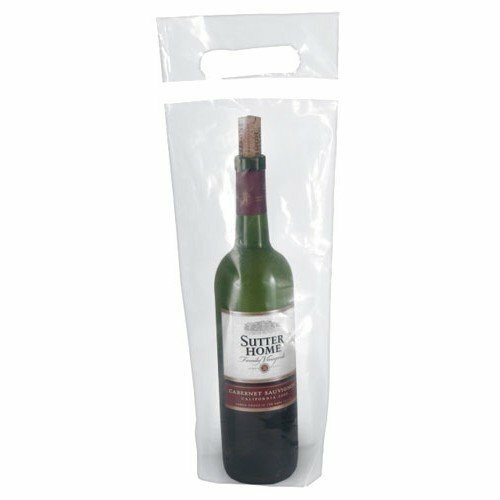 The bags have a an easy handle for carrying and come in packs of 50.50 Pqa STATE TAKE HOME WINE LAWS AND REGULATIONS All states now allow you the pleasure of finishing your wine at home. Many require, and others recommend, that the bottles be taken from the restaurant in sealed and tamper-proof wine to go bags so as not to Ideal for any Bar or Restaurant.